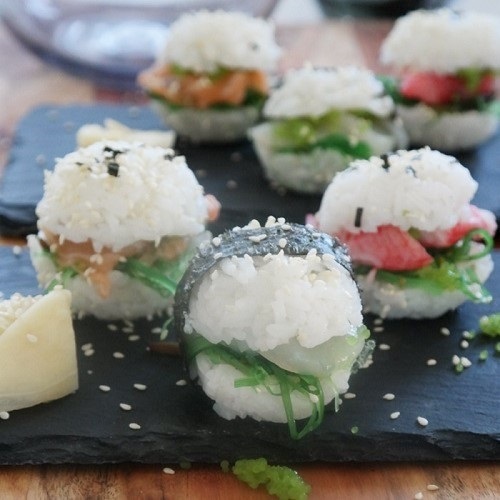 Instagram is a cornucopia of inspiration and a little while a ago I saw a picture of a sushi burger that looked so delicious and delicate and I thought that it would give it a try. 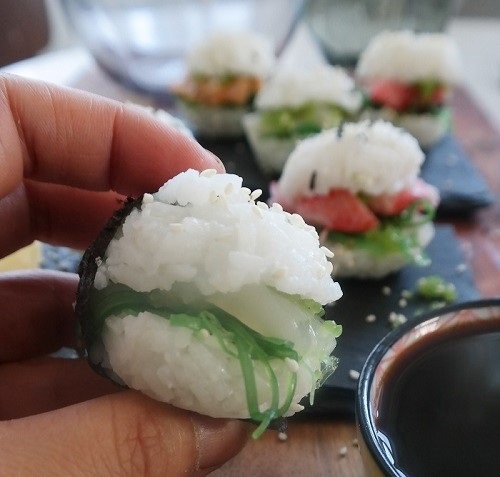 I have used my usual sushi rice recipe and( see further down) and soon found out that small mouth full was the best to make than big burgers that falls a part after a bite or two. Pack the rice into a small bowl and tip them out and place them ona tray or dish. On some of the sliders I put a band of nori on to make it easier to pick them up with your fingers. 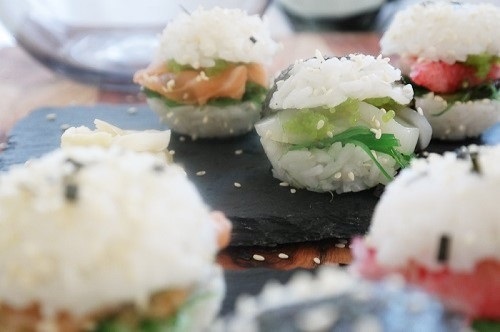 Drizzle some sesame seeds and chopped nori on the sliders. 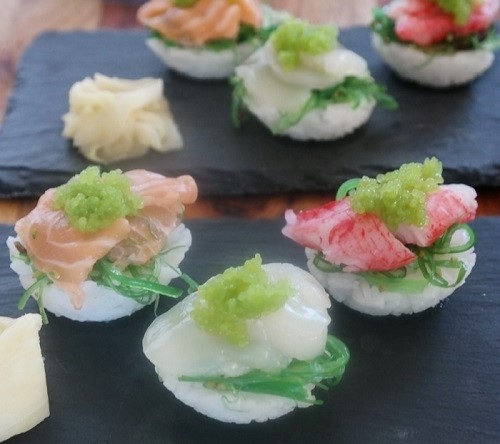 Serve them with pickled ginger and soy sauce. The only thing to do now is to enjoy your meal. Rinse the rice until the water is clear and let the rice drain in a fine mesh strainer for about one hour. Boil the rice in a saucepan until the water begins to boil, reduce heat to medium and cover with the lid, let it boil for 5 minutes. Reduce the heat again at the lowest temperature and let the rice soak for 12-15 minutes. Remove the saucepan from the heat, remove the lid and cover the pan with a tea towel and replace the lid and let it stand for 15 minutes. While rice is cooking, mix vinegar mixture and boil gently until the sugar is completely dissolved, stirring occasionally. Once the sugar has dissolved remove it from the heat and allow mixture to cool. 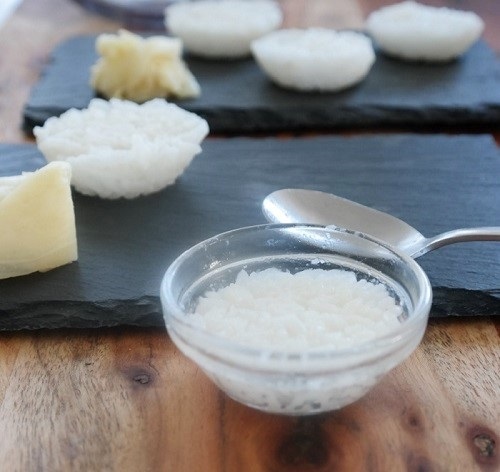 Spread rice in a non metallic tray with a wooden spoon. Run the wooden spoon through the rice to separate the grains and slowly add the vinegar mixture, the rice should me a little moist and not wet. Fan the rice with a fan or with a piece of cardboard until the rice reaches room temperature. Cover the rice with a clean towel until ready to use. This rice keeps a about a day.